Which Should You Opt For ? To prepare your milk kefir, you may use kefir grains or commercial powdered kefir starter. This article will show you the advantages and disadvantages of using both. Kefir starter (powdered) is produced commercially. You can buy this kefir starter as a multi-pack or single pack. This preparation contains limited probiotic, which are listed on its packet in the “ingredients” section. Powdered starter ought to be refrigerated. Why use a Kefir starter ? Powdered starter is always easier to use and therefore appropriate choice for beginners. It is almost always prepared in sterile environment, then cultured commercially. The benefit is that the ingredients consist of a comprehensive list of all these beneficial yeasts and probiotic bacteria contained in a product. If you have chosen a powdered starter, you know which beneficial organisms are being used and ingesting. You may buy individual sachets of pre-made commercial kefir at a cheap price as a matter of fact. The downside is that you can’t keep reusing the cultures. At the most and depending on brands, you might get about six batches out of the sachet of the commercial kefir starter. Be aware of the number of recaptures of your sachet can be considerably lesser than six. In the long term, commercial culture starter ends up being more expensive than traditional kefir grains. One sachet is added to milk for one typical batch of your kefir. Eventually the milk stops culturing with a sachet of the starter culture. But you are going to get a load of kefir before it happens. Each product differs in volume. Kefir grains happen to be way fascinating than the powder. To see them clump, multiply, and function is absolutely stunning. Kefir grains resemble cauliflower florets. They are a well blended mixture of beneficial yeasts and probiotic bacteria in a base of sugar, fat and protein. These “grains” however, don’t contain any sort of cereal. However, they generally contain dairy, especially milk casein. Non-dairy alternatives of the milk-based grains are available these days. 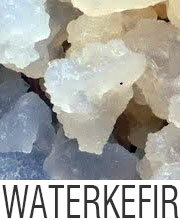 These may also be used for preparing water kefir or coconut kefir. Kefir grains are irregular shaped small crumbs, which are found to stick together, like the cauliflower florets. 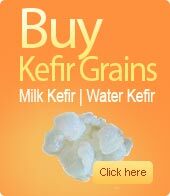 Why opt for Kefir grains? The main advantage of these kefir grains is that they are reusable over and over again, provided you store these grains in a proper manner. If you have done so, they are going to last forever. In the long-term, this makes the grains worth the money. Another benefit of these grains is that typically they consist of a larger and of course diverse range of beneficial yeasts and probiotic bacteria than the kefir starter, the powdered ones. The actual species as well as the strains of bacteria in the grains will vary and depend on geographic locations. Finally, similar to the powdered starter, the traditional grains are easily usable. 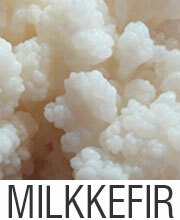 The basic drawback of the traditional kefir grains is the time required in their preparation and storage. Once the kefir has been prepared, one has to retain the grains. In preparing those for storing you ought to rinse with cold water, keep them in prescribed containers and cover using water. The initial outlay may be another deterrent to kefir grains. You might not be sure if you will prefer kefir and you may think that the cost of being high. The best thing is to purchase a single sachet of the commercial starter or buy ready-made kefir milk. Home prepared milk kefir always tastes way better than the bought kefir. Details about the species or strains of the probiotic organisms in the kefir grains are usually unavailable. You will thus not know the exact probiotic bacteria or the exact beneficial yeasts present in the homemade kefir. If you’re willing to go for the ‘live’ kefir grains, they’ll be sent by post, in little milk. If you want to order from abroad, the kefir grains will then be freezed and dried. So, hurry up, decide which would be the ideal option for you and prepare kefir to maintain a healthy you and a healthy family. Cheers. Tagged Kefir ferment, Kefir Grains versus Kefir Starter, Kefir starter, powdered kefir starter, Why live kefirgrains are better ?